Teeth are usually a bad sign. Drooling and the smacking of lips should really be a tip off. The skeletons of other space explorers strewn about is a bad sign. Go on Biff, just reach in there with your other arm and pull the detached one out. Those sharp-looking things in the background… Can we really be sure that they are just mountains, and not enormous, jagged teeth, like the molars of some carnivore? 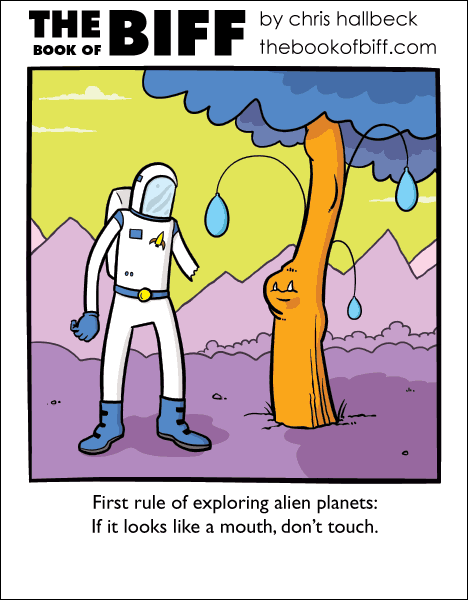 Maybe the planet’s got teeth?! And is the tree sinking? Must be a sequel to yesterday! Maybe Biff is still exploring the same planet! Continuity in The Book of Biff? So should we expect Biff missing the same arm tomorrow? What other dangers lurk on this world? Maybe he’ll keep losing parts on this planet day-by-day. On Friday he’s just a torso. On Monday he’s magically home and whole again, ready for a new series of unnecessary amputations. At first I thought the teeth where eyes, and the line under them was the mouth. It looked like a happy tree who just had a great, lovely snack. The message, “Send more long pig” is also a bad sign.